The monsoon season has already started in India and that means its about time when we have to bid goodbye to our most favorite fruit, mango for a whole one year. And it's really hard for me as I love this fruit a lot. So, for time-being, when we're still getting many varieties of mangoes in the market, I'm making most of it. On one facebook foodie group, I saw someone made Mango Semolina cake and I had to try this immediately. 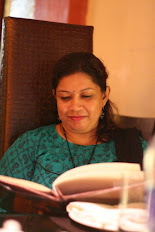 If you remember, I've posted few months back the Eggless Semolina Cake, which I make quiet often at home. 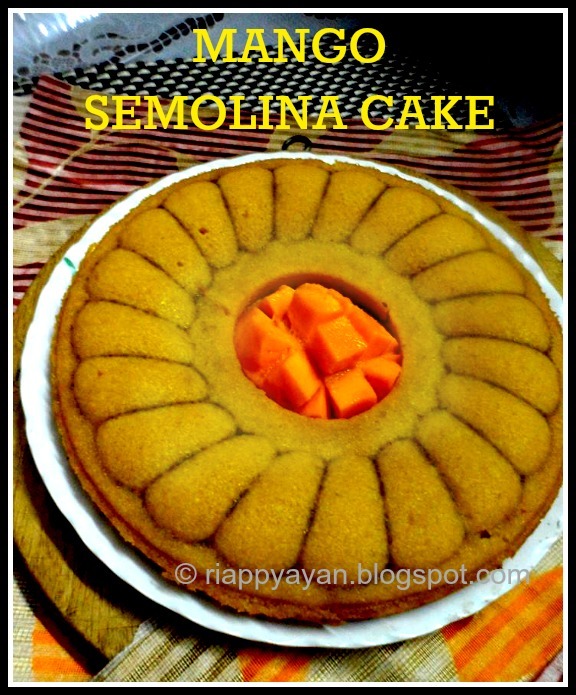 It was just that you have to add mango puree in the same batter and you'll get Mango flavoured semolina cake, the taste was heaven for a mango lover like me. In a bowl, take sugar and yogurt. Stir to mix them so that sugar dissolves fully. Then add suji/semonlina, mango puree, oil and all the other ingredients one at a time and mix properly. Do not overmix. Add more or less milk depending on the consistency of your batter. Note :: There should not be any extra fluid in the batter, just all the ingredients should be properly mixed. Pre-heat your oven to 180 degree C. Grease your baking pan with butter or oil and then pour the semolina mixture into the pan. Bake for 40-45 minutes or until a wooden skewer inserted in the center of the cake comes out clean. Let it cool for half an hour before you de-mould it from the baking pan. Then cool the cake in room temperature and slice it afterwards. It is a great accompaniment with evening tea/coffee. Cake looks delicious. Never baked a cake using just semolina. Will bookmark this to try it. so nice and yummy !! best is that it is eggless..